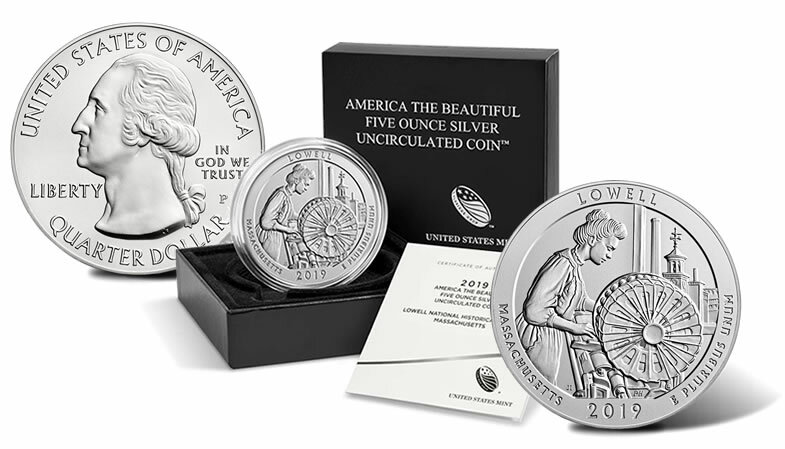 Coming on the heels of its related quarter release, the United States Mint today, Feb. 7, began accepting orders for the 2019-P Lowell National Historical Park Five Ounce Silver Uncirculated Coin. Each is composed of 5 ounces of .999 fine silver and features a diameter of 3 inches. The design on the reverse (tails side) is emblematic of Lowell National Historical Park. This Lowell coin is the 46th release of the U.S. Mint’s America the Beautiful Five Ounce Silver Uncirculated Coin™ series and the first of five for 2019. 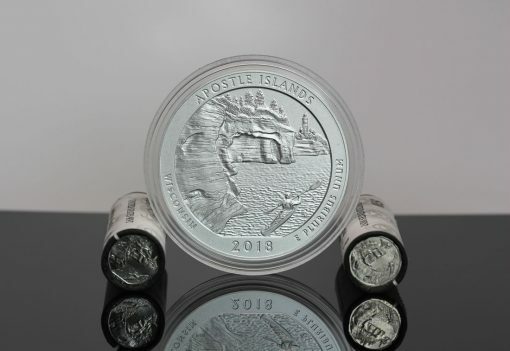 Like the associated program of quarters, the series debuted with 2010-dated coins and will include of total of 56 unique designs depicting a different site of national interest. Designs on the coin match those on the Lowell National Historical Park Quarter. Found on its reverse is a mill girl working at a power loom with circular bobbin battery. Behind, we see Lowell, Massachusetts through a window with Boott Mill clock tower in the distance. Inscriptions include "LOWELL," "MASSACHUSETTS," "2019," and "E PLURIBUS UNUM." The design was created by U.S. Mint artist Joel Iskowitz with sculpting by Mint sculptor-engraver Phebe Hemphill. This CoinNews photo shows the second 2018-dated America the Beautiful coins from the quarter and 5-ounce series honoring Apostle Islands National Lakeshore in Wisconsin. It highlights the size difference between quarters and 5-ounce coins. The obverse has John Flanagan’s portrait of President George Washington. This likeness of the first U.S. President initially appeared on the 1932 circulating quarter dollar and has been on quarters ever since, with some minor adjustments. Also on the obverse is a mintmark of ‘P’ indicating the coin was produced at the U.S. Mint’s facility in Philadelphia. Each piece also has a flat edge with an edge inscription reading: "999 FINE SILVER 5.0 OUNCE." 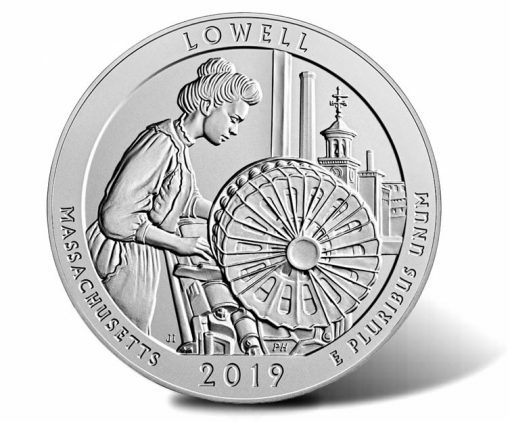 Priced at $154.95, the 2019-P Lowell Five Ounce Silver Uncirculated Coin is available directly from this U.S. Mint product page. Orders may also be placed by calling 1-800-USA-MINT (872-6468). Mintage is limited to 20,000 coins with no household or ordering restrictions in place. Like all five ounce silver uncirculated coins, the U.S. Mint also produces five ounce silver bullion versions. The bullion coins have a brilliant finish unlike the vapor blast finish of the uncirculated variety. Bullion coins also lack a mintmark despite also being produced at the Philadelphia Mint. Another differing factor is that the bullion coins are not sold directly to the public like the uncirculated coins. Instead, they are sold for a small premium over spot through the Mint’s network of authorized purchasers. The U.S. Mint will begin accepting orders for the five-ounce Lowell bullion coin on March 11. Hi Scott, I have the entire set so far, all purchased directly from the mint, and no sign of toning at all. They are all stored in the same box in my closet. I have bought some commems on the secondary market and I’ve noticed some toning on those – maybe they were removed from the OGP? – I’ll never know. I can open a 1 oz silver slab with relative ease with 4 common tools.., NOW for a sturdy, solid 5oz slab, it must get very difficult and I’m not sure how you would break open a 5 oz slab without the use of power tools – therefore, if an electrical band saw or orbital saw was used, the blade is going to heat up quickly and that plastic and glue adhesive on some capsules will give off some fumes, would like a white opaque smoke, and if that residue got on the coin, which is most likely would, there’s your catalyst for possible toning. This might make sense as the two worst offenders were both slabbed coins…. You can bust the 5 oz slabs with a strategically placed hammer blow without damaging the coin. No power tools needed. I own a few select 5 OZ Coins (like the Gettysburg) that I purchased from MCM and none of them show any signs of toning.